Using data from the Herschel Space Observatory, astronomers make a direct comparison between observations and chemical models for oxygen species in conditions just before star formation. Warm water vapor in the interstellar medium (about at room temperature) behaves roughly as expected from chemical models. This was the conclusion reached from observations by the Infrared Space Observatory about fifteen years ago, subsequently confirmed by the Submillimeter Wave Astronomy Satellite. However, in the colder conditions that exist in molecular clouds, and in particular in the denser clouds where stars might form, most of the water is frozen as ice onto the surface of dust grains where its properties are much harder to understand. Moreover, since the molecule itself is produced mainly on the surfaces of such grains where atoms of hydrogen and oxygen meet and bond, the several processes underway on the grain surface are complex. In order to test chemical models that include grain-surface chemistry, CfA astronomer Eric Keto and two colleagues observed water in the cold, dense cloud L1544 with the Herschel Space Observatory. Small clouds like this one are only about a light-year in size and contain about a hundred solar masses of cold (less than 15 kelvin) material. They have the advantage of being relatively simple: nearly spherical in shape and with no internal sources of heat (i.e., no stars). They are warmed from the outside by cosmic rays and by the ultraviolet background of starlight; from the inside they are cooled via radiation from molecules and dust. Their simplicity makes them uniquely powerful laboratories for testing complex hypotheses like the chemistry of cold water. The scientists combined three different theoretical techniques to analyze the data on this source: a model to describe the cloud density, temperature, and structural properties, a chemical model to predict the abundance of water under various conditions, and not least a model for the radiation emitted by cold molecules that traces how it travels through the cloud and into space. The astronomers are able to fit the observed results very well. They conclude that water vapor is evaporated from ice by cosmic rays and ultraviolet, and that near the edges of the cloud the radiation can also destroy the water vapor, breaking it up into constituent atoms. The water vapor is seen in both absorption and emission, and the team also concludes that the latter comes from the densest part of the inner cloud where it can provide unique insights into the dynamics at the very center of the dark cloud. 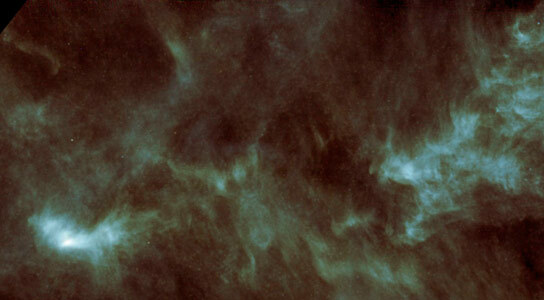 Be the first to comment on "Herschel Observations Help Identify the Physical Processes Underway in Cold, Dense Clouds"